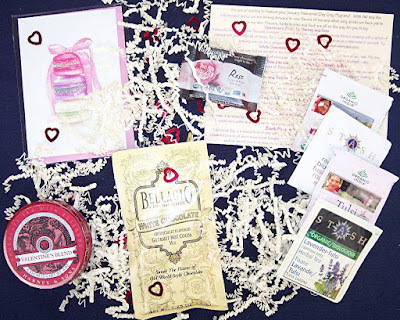 Surprise My Pet Review, January 2016 + 10% & 25% Discount Codes! 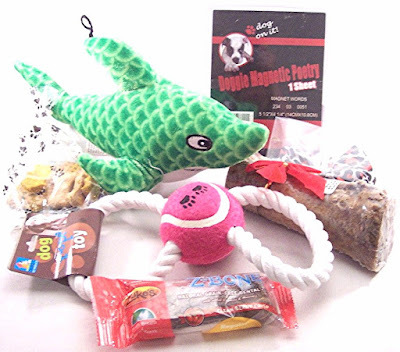 There are quite a few dog boxes in the subscription box universe. A favorite around our house is Surprise My Pet. 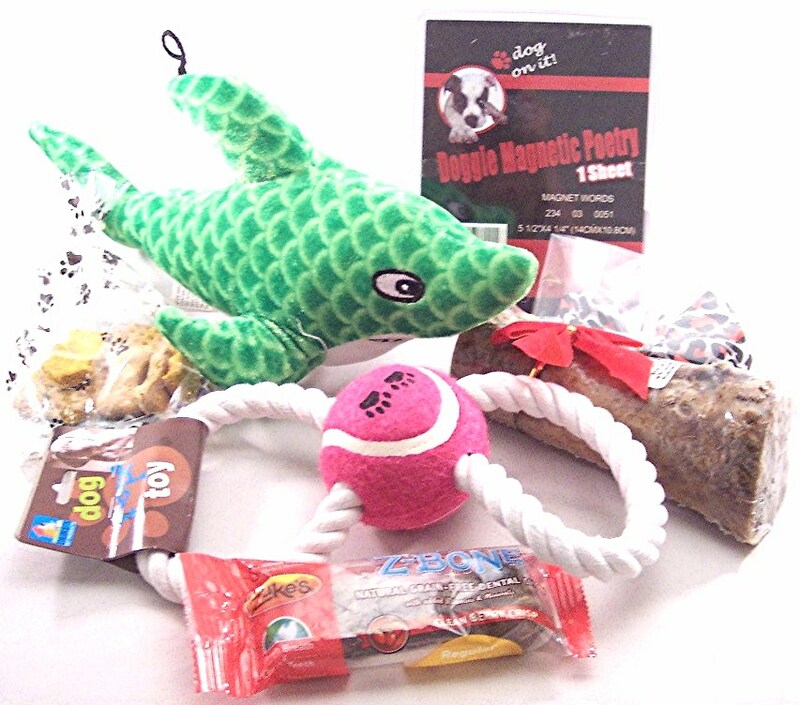 The toys and treats from most of these companies are similar (probably sourced from the same vendors) but what distinguishes Surprise My Pet is that they include some type of costume or doggy accessory in each box. 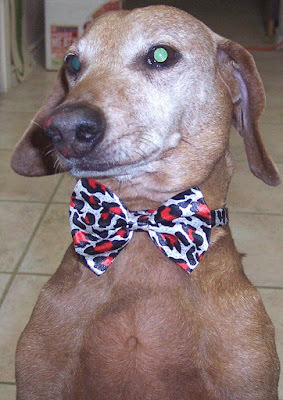 So, if your pup is a ham (like both of mine are), they can dress fashionably year round! The product card gives minimal information but does tell a bit about each item. 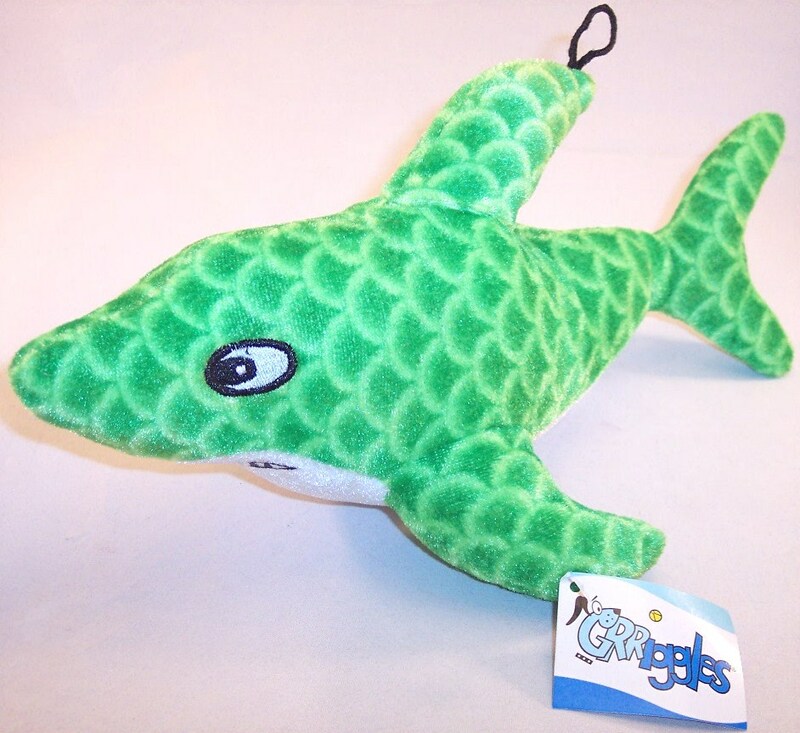 There is a rather fierce looking plush green shark with a squeaker buried deep inside. Since my evisceration specialist Dakota could have this guy gutted in about two minutes, it will be going to a kinder, gentler home. Good thing I took a photo of this bone because it's now buried somewhere in the back yard. This was a big heavy smoked bone from Ranch Rewards. I gave it to 50 lb. Dakota; within seconds, it was being stealthily removed from the premises by 24 lb. Tucker. (HUGE bone confiscated by little dog! Really funny sight which I unfortunately couldn't catch on camera.) No matter...there's enough bone here to keep both of them occupied for days and days. 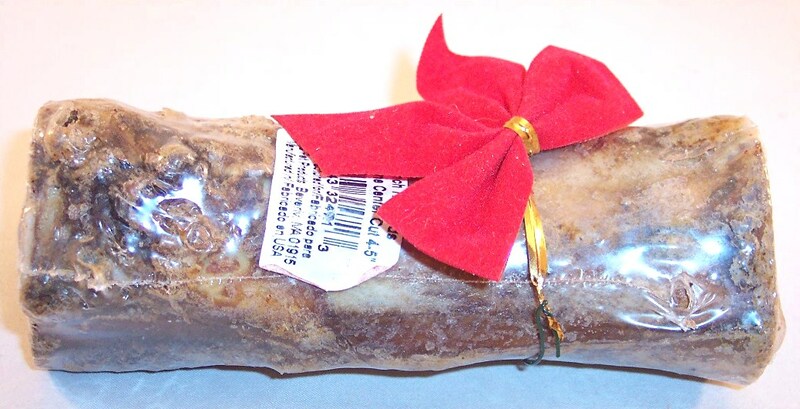 I don't expect (or want) to ever see this bone again. This paw print bag contains some hand-crafted treats from an Etsy seller named Shorty's Gourmet Treats. There are two pumpkin flavored fire hydrants, two peanut butter bones and two sweet potato squares; all most enthusiastically appreciated by my boys! The best dog toys around here are the indestructible toss/tug/chew combinations like this rope toy from Duke's Pet Products. Although Dakota is new here, I have already seen him playing tug o' war with Tucker and I think this very strong toy will encourage that. If not, Tucker lives to chew and tug so he and I will get a lot of use from this one. 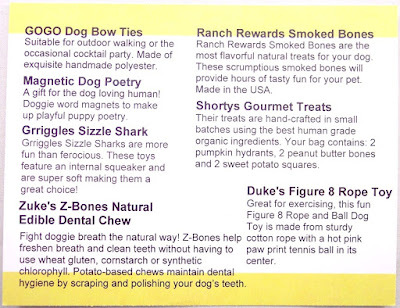 There is a bone-shaped dental chew from Z-Bone which helps freshen breath and clean teeth. Oddly, the main ingredient in this is potato flour and the flavor is Clean Berry Crisp. As usual, Surprise My Pet did a great job of putting this box together. 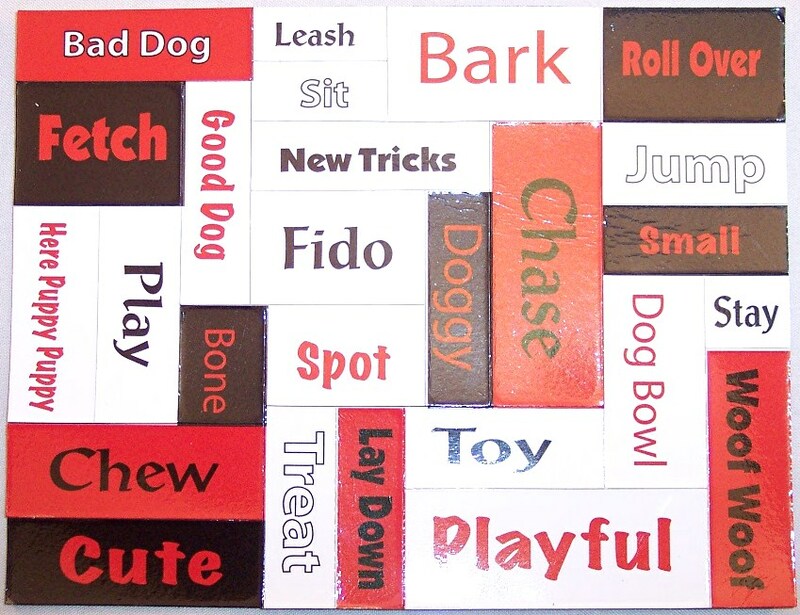 All of the edible treats were big hits with Tucker and Dakota (especially that huge bone) and I appreciated the inclusion of the magnet set. 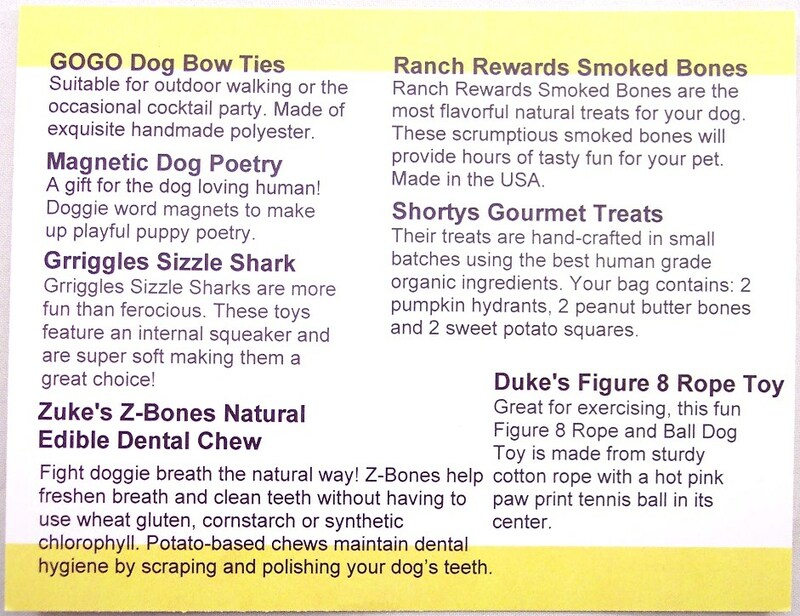 I like that they find safe and healthy products and focus on all-natural treats. Most of all, I love seeing the joy my puppy boys take in their monthly surprise box! If you want to sign up for Surprise My Pet, the code PUPSRULE will get 25% off an annual subscription, making it $203 or just $16.92 a month....an exceptional value! Also, I believe the code LOVE will get 10% off any plan. Keep an eye on the deal sites for big discounts on this subscription. I know that they have run great Groupon promotions in the past, although I don't see one right now. One nice thing about Valentine's Day is its effect on subscription boxes! 'Tis the season and the Valentine inspired loot is starting to roll in. 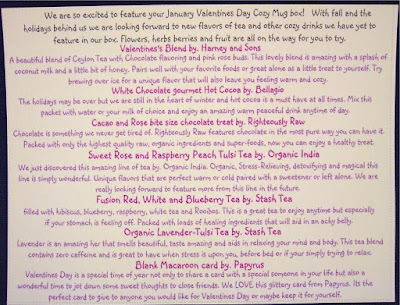 The Cozy Mug, with its mission of sending teas and related fun surprises, is well positioned to take advantage of the season of Love! When I signed up, the price per month was $19.95. It is now $20.95. Apparently, I've been grandfathered in as I'm still being charged $19.95 per month. That's a good thing as the value of this month's box was disappointing. Read on and let me know what you think. 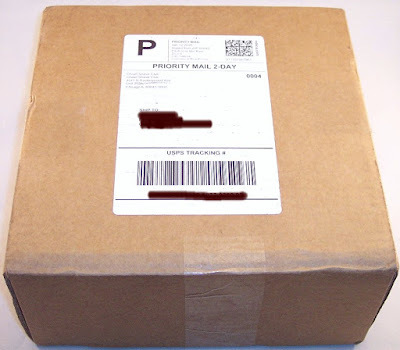 The Cozy Mug is shipped in a USPS Small Flat Rate box which costs $6.80. I know a few things about shipping. This box weighed 8 ozs., which is well under the threshhold rate for Priority, meaning that it could have been shipped First Class. For my zip code, that would have cost about $3.54. 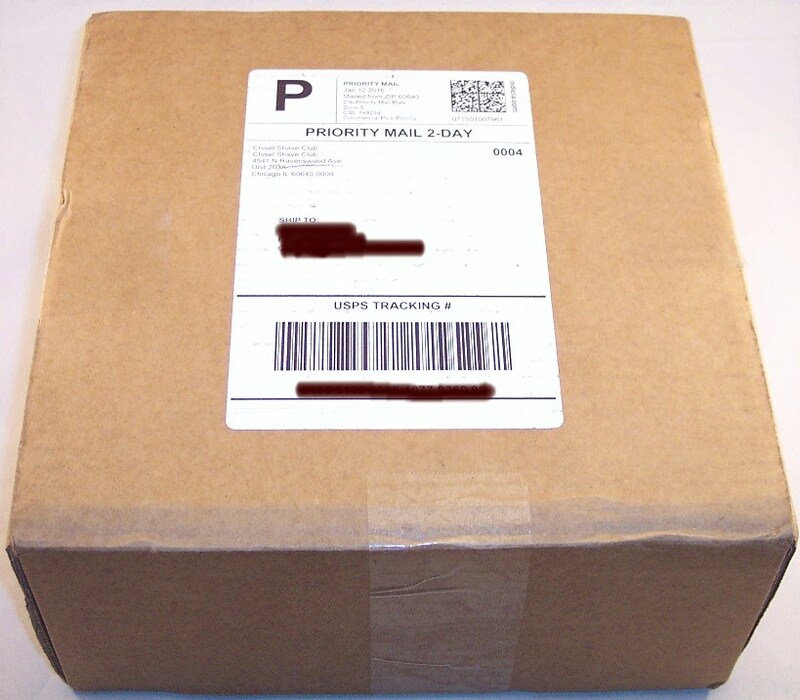 It's hard to understand why The Cozy Mug is using a shipping method that requires almost twice the necessary postage, especially when that extra money is desperately needed to augment the contents of the box. 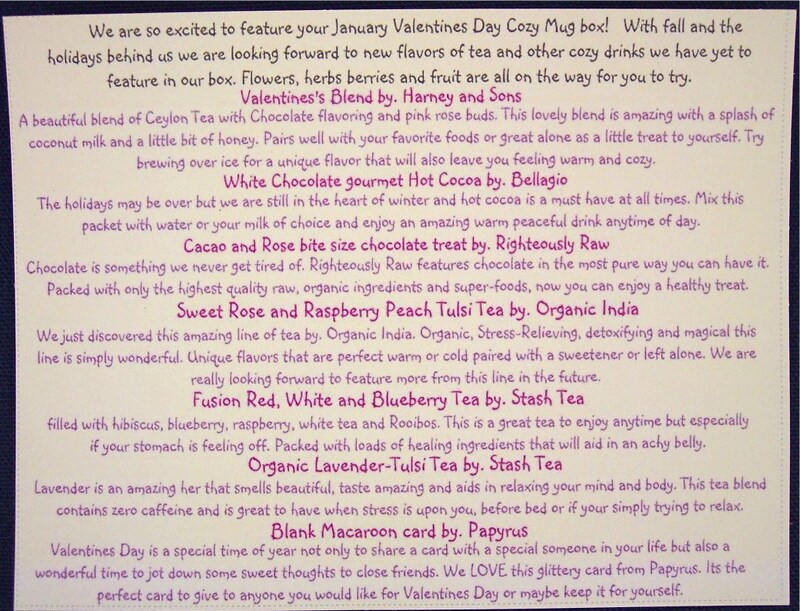 A product card tells a little about each item but does not provide retail values. 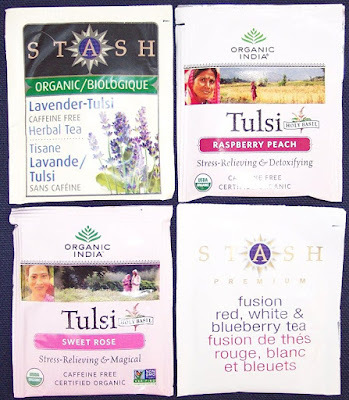 There are four individual tea packets, two from Stash Tea (Lavender Herbal and Red, White & Blueberry) and two from Tulsi (Sweet Rose and Raspberry Peach). 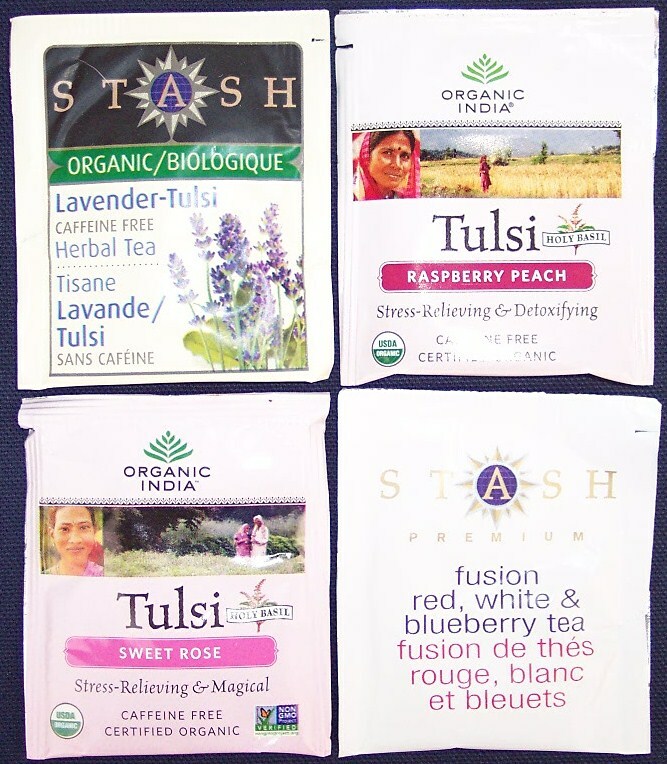 I'm familiar with Stash Tea but Tulsi is new to me and those flavors are intriguing. 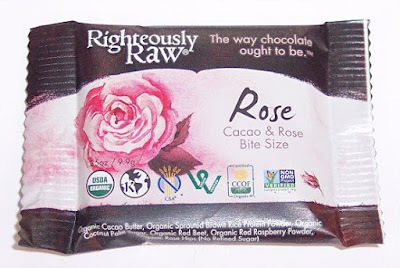 Next is a very small piece of chocolate from Righteously Raw which has a bit of rose flavor. I'm not a big fan of raw chocolate and this was just too sharp and bitter for me, however seasonally appropriate. 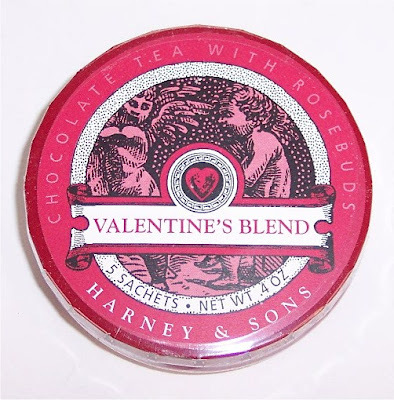 This cute tin from Harney & Sons holds five silk tea sachets containing Valentine's Blend, a mix of Ceylon tea, chocolate flavoring and pink rosebuds which "invites romance and warms the heart". I already like this! 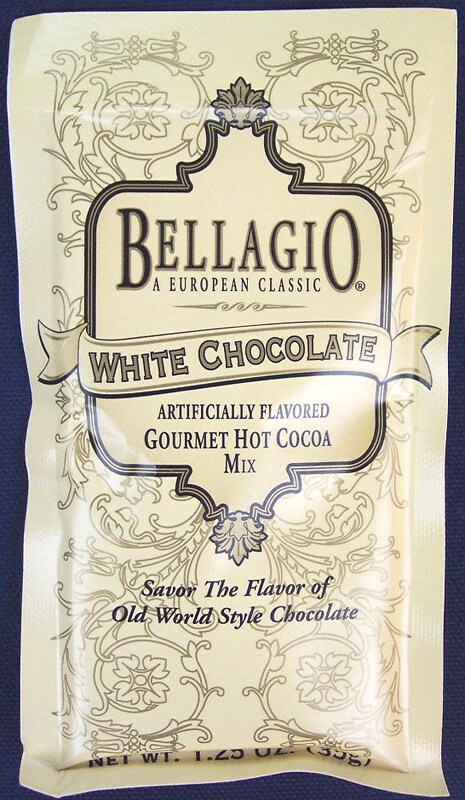 Next is a single serve White Chocolate Gourmet Hot Cocoa Mix from Bellagio. 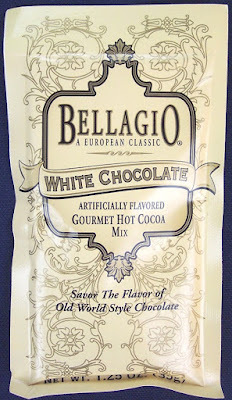 Can't say I've ever tasted a drinkable white chocolate before but I bet this is good. 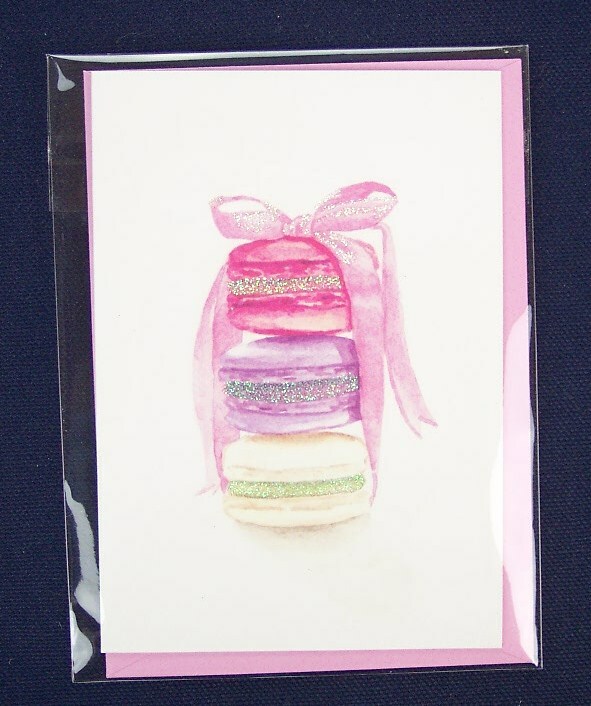 Last is a beautiful little greeting card with a stack of pastel colored macaroons (or macarons if you want to get technical) on the front. Their centers are quite sparkly and they are tied with a pink ribbon. 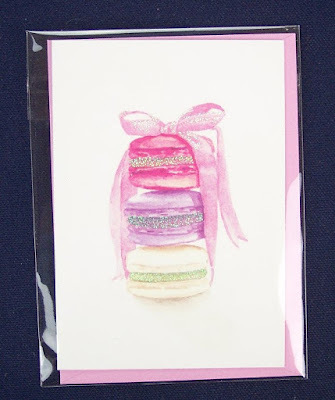 The matching envelope is pink and it has a little macaroon on the outside. I know just who will get this. Tres cute! You can make a one time purchase of The Cozy Mug for $24, but I don't recommend that. If you're interested, just sign up for the subscription at $20.95 per month, then cancel whenever you wish. The curation of this box is creative and fun but you'll have to decide whether it's worth the price. 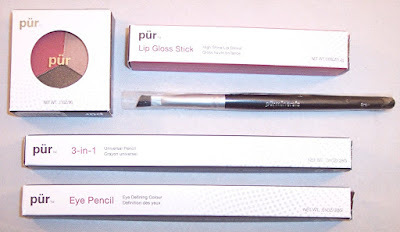 Pur Minerals Mystery Grab Bag Review, January 2016 + Discount Codes! Up until now, Pur Minerals cosmetics were not really on my radar screen. Despite my overflowing cosmetic shelves, somehow I don't own a single Pur product. That could be because they haven't participated much in subscription boxes and/or their products aren't marketed in the places I usually shop. Whatever the reason, I decided to try their Mystery Grab Bag which is advertised as containing five full sized products with a total retail value of around $100. Although the customer reviews have been quite mixed, at just $15 (less another 10% if you sign in through eBates), there really wasn't much risk. The five items arrived in a small unmarked box with absolutely no paperwork...no information card, no coupons, no ads, no nothing. 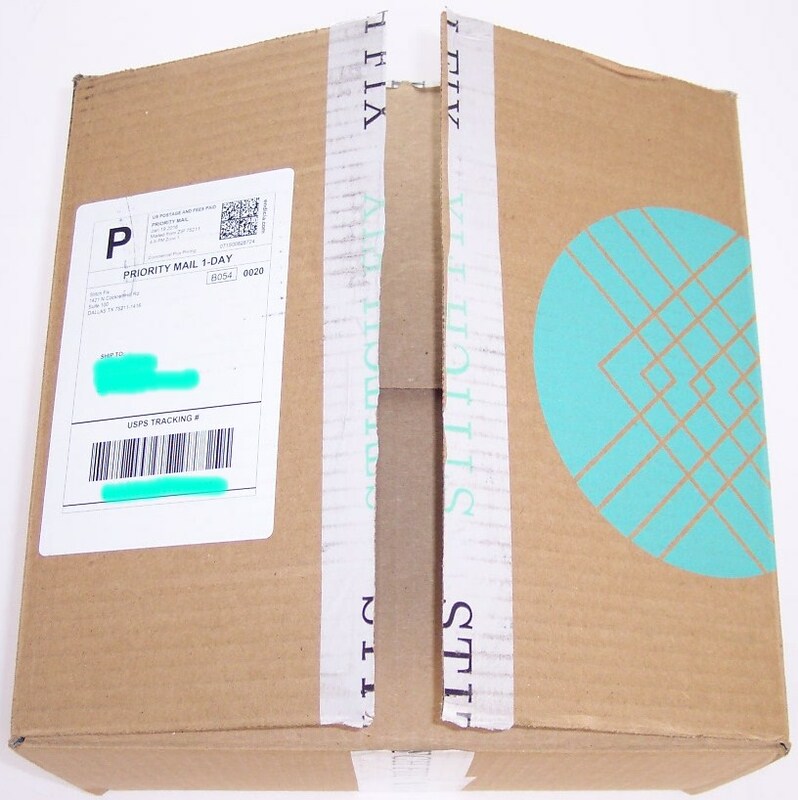 That immediately made me suspicious that they are using this box to dump old merchandise, which was one of the frequent criticisms in the customer reviews on their site. 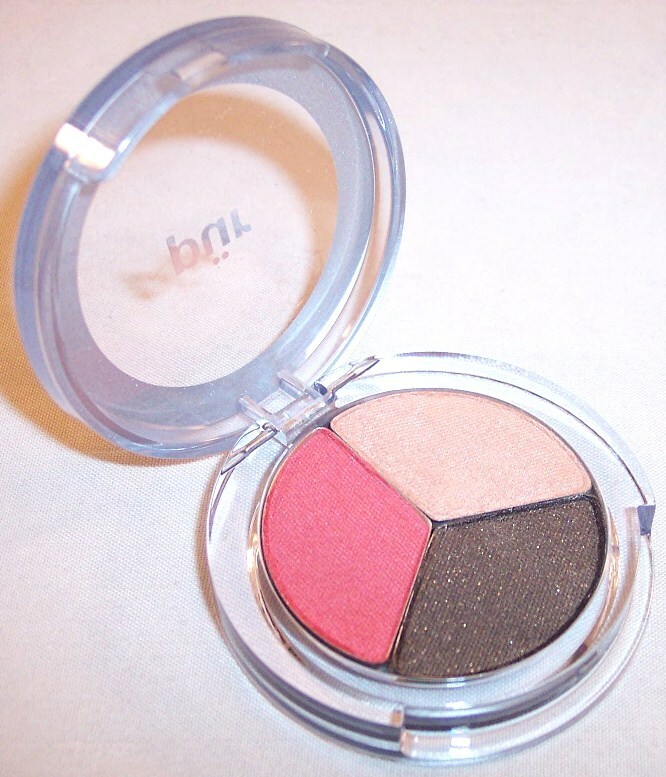 The first item is a versatile eye shadow trio in the shade set "Matchmaker". 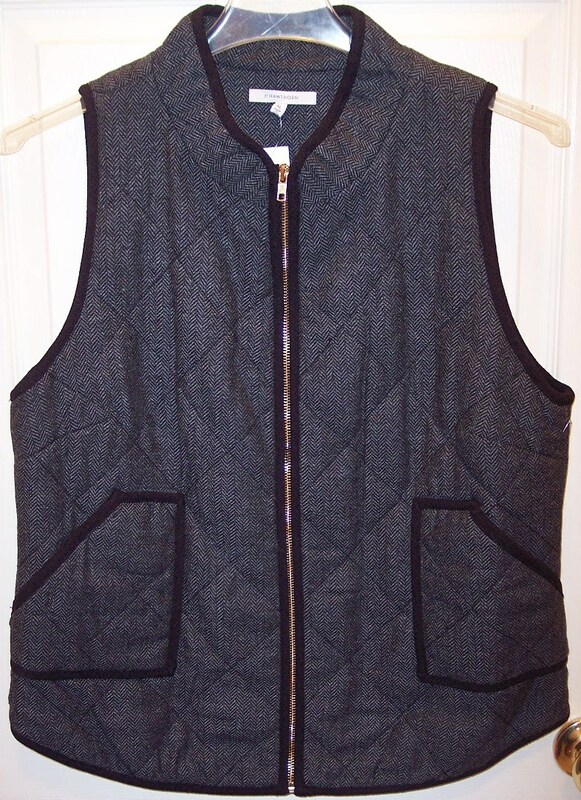 This is a current product on their site that retails for $14. The colors are more intense than they look in the photo; a deep rose, a pale dusty pink and a shimmery chocolate brown. So far, so good! 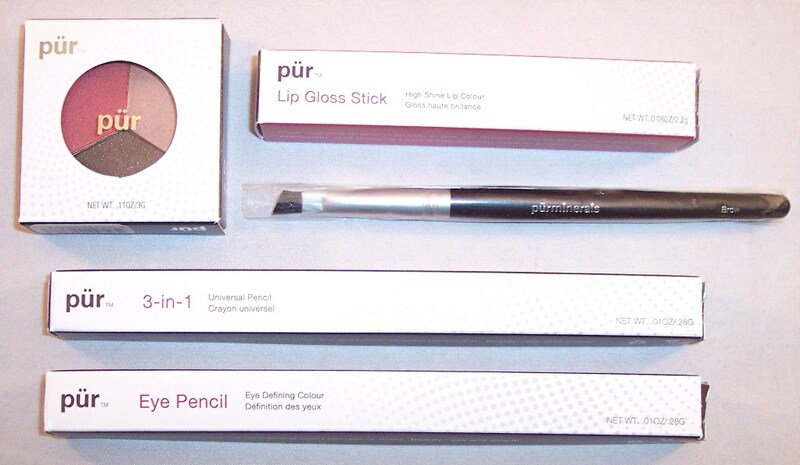 Next is a 3-in-1 Universal Pencil in "Natural", a light to medium brown color. This self-sharpening pencil has a spoolie on one end and can be used on lips, eyes or brows. The color is smudge-proof and long-lasting. I tried a little of this on my wrist; it has good color transfer and makes a fine precise line. This is also a current product that retails for $17. I could not find this brow brush on Pur's site but it is available on a couple of other retail sites for $13. Its flat angled tip allows for perfect eyebrow shaping and defining. This Lip Gloss Stick in "Daredevil" is a current product retailing for $16 on Pur's site. This high shine gloss comes in the form of a chubby pencil and is loaded with rich emollients and Vitamin E. I would have preferred a more modest color but this is a really nice product that gets rave reviews from customers! The fifth item is an eye pencil in "Hidden Treasure" which is described as a rich, shimmery brown shade. It actually looks more like charcoal on my skin. There is a smudger on one end which allows for versatile application. 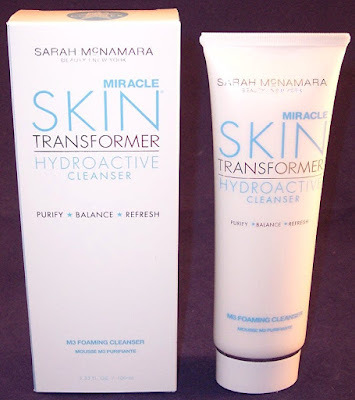 This product was pretty hard to find but I finally located it on Dermstore's site for $17. 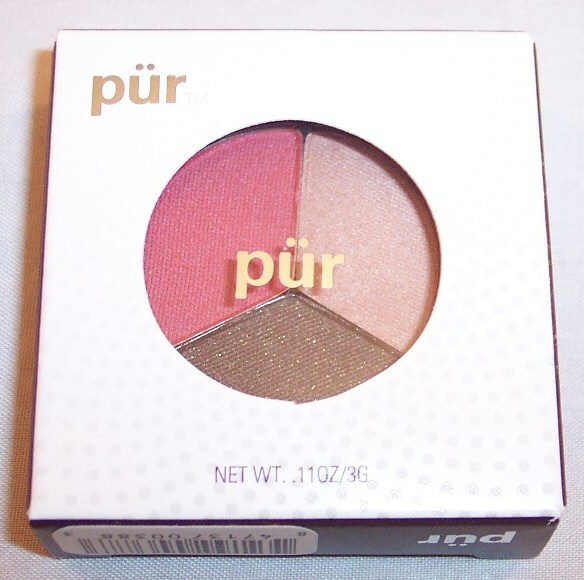 Other shades are on Pur's site for $7. Using the most conservative retail prices, there is about $67 in retail value here. That's far from the $100 estimate, but I'm not complaining! Each of the first four products alone are just about worth the price of the box. These are all current products in usable attractive shades. It's clear that customers receive different items but by any measure, this particular box was a huge score! 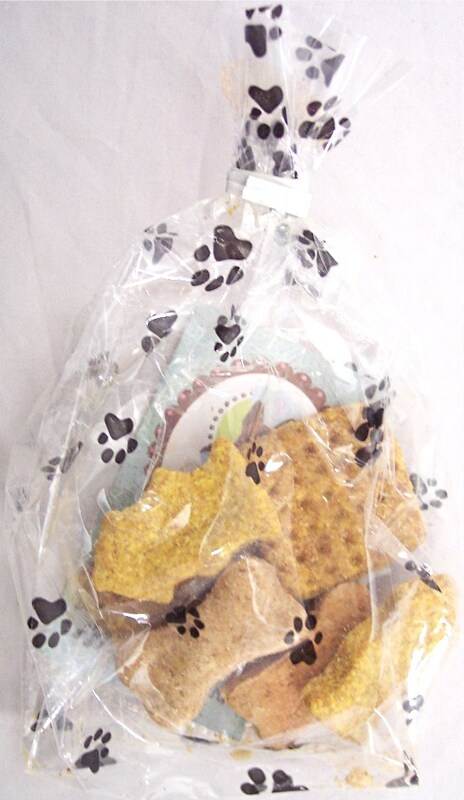 The good news is that Pur's Mystery Grab Bag is still available! Normally, shipping is $5.95 but you can get FREE shipping by using code AMFREESHIP at checkout. 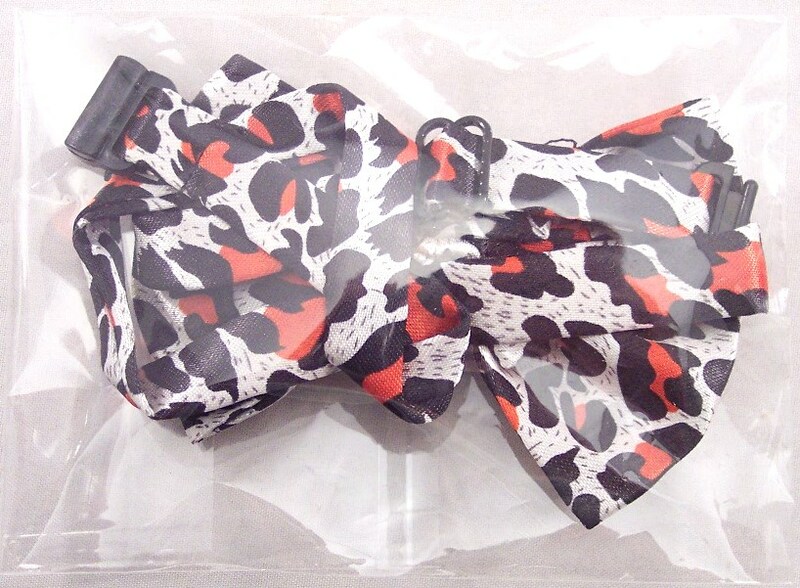 Also, the code Sample20 will get a 20% discount which may be useful if you purchase other items from Pur's site. And don't forget to sign in through eBates for an additional 10% rebate on your Pur Minerals order...effectively making the Grab Bag only $13.50!! If beauty sub boxes were arranged along a continuum from "least customized" on the left to "most customized" on the right, the majority of them would sit towards the left end. Wantable Makeup would sit somewhere to the right of center and WAY out to the right would be Beauty DNA. For $25 a month, they send a product that is specifically matched to your individual preferences and needs. When signing up, you complete an extensive profile indicating things like age, skin tone, fragrance and product ingredient preferences, hair and skin concerns, formulation preferences, skin issues, etc. Once your profile is complete, they use their patented product matching system to search among thousands of products for one that specifically meets your needs. 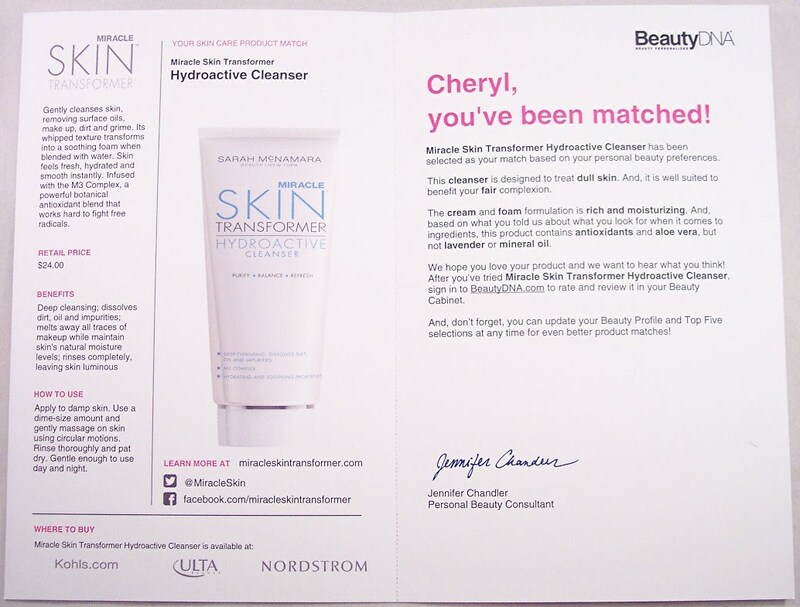 That item comes to you accompanied by a detailed Beauty Report which explains why it was chosen for you, what it does and how to use it. 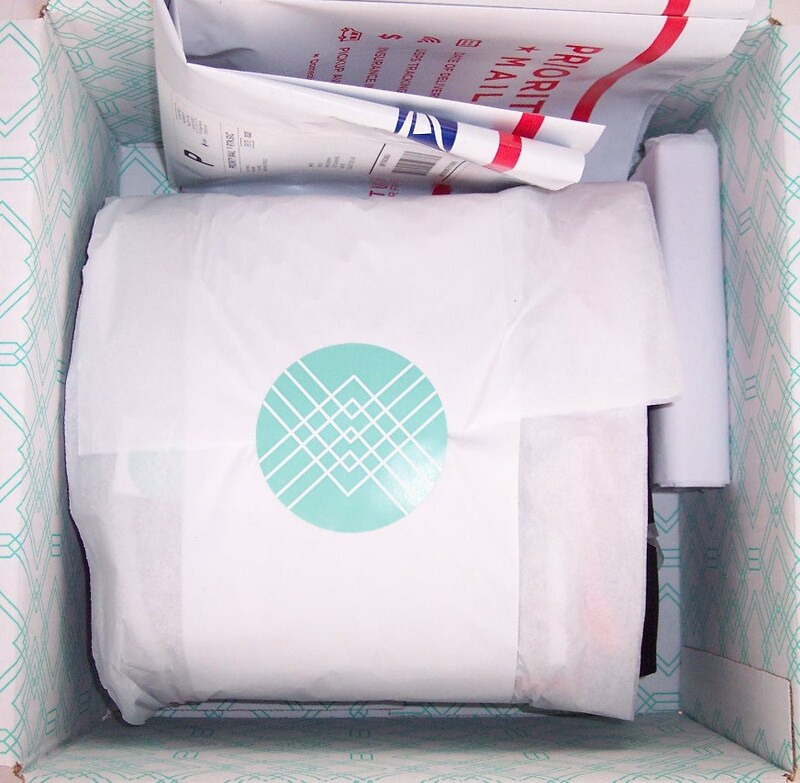 The box you get will include a full size hair, skin or body product that is generally matched to one of the Top Five Concerns expressed in your profile. In my experience so far, the products have been mid range to high end and are generally new-to-me brands. 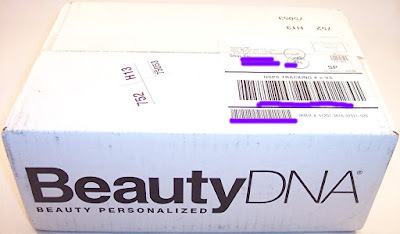 My January Beauty DNA box actually contained two items and two Beauty Reports. But first things first; the product(s) arrives in a medium size white branded box. The items were packed inside a lot of crinkle shreds wrapped in tissue and sealed with a sticker. 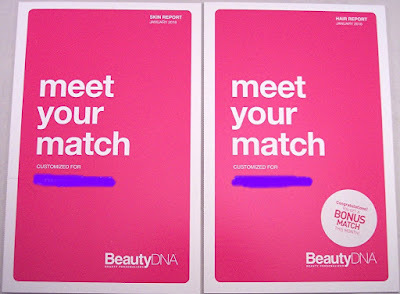 Normally, there is just one Beauty Report but I received two this month. One of them has a seal that says "Congratulations! You get a bonus match this month". First time that has happened for me. Because this service is so highly customized, your full name is printed on the outside of the Beauty Report and you are addressed by your first name on the inside. 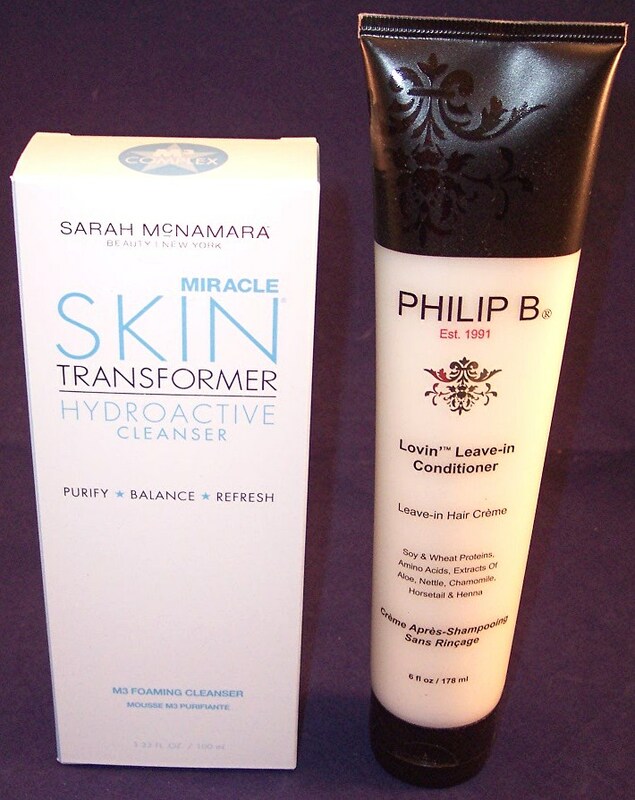 Here are the two items in my box; a full size skin cleanser and leave-in conditioner. The cleanser is the feature item; the leave-in conditioner is the bonus. This is the product; a 3.33 oz. tube that looks like enough to last for a long time. I like that there is a lot in this tube and it is light in texture. Although I'm familiar with this brand, I haven't tried it before so am glad to have a chance to road test this product. 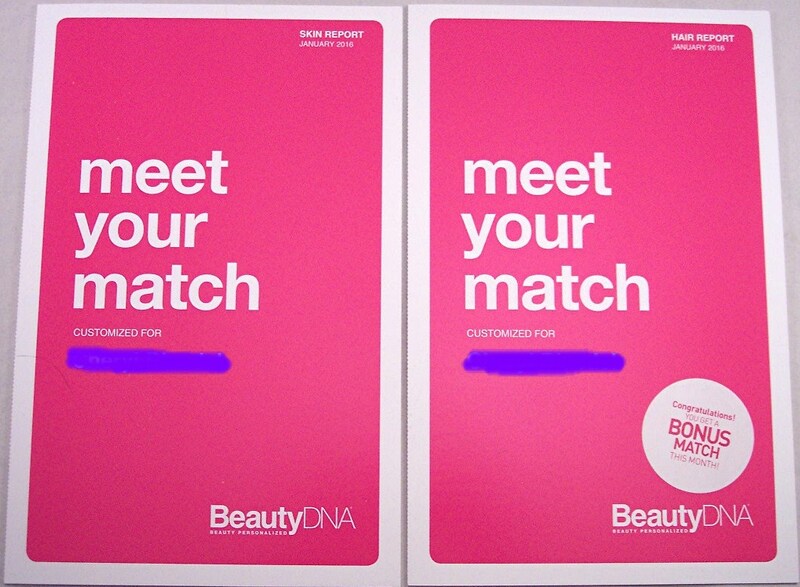 Click here if you'd like to try Beauty DNA. This is not the least expensive beauty sub out there but it just may be the most effective! P.S. I want to mention this company's stellar customer service. 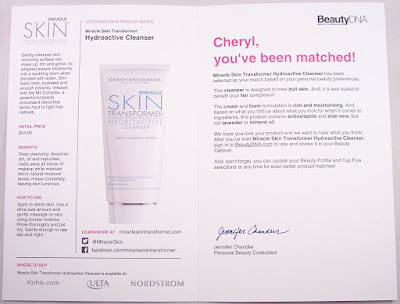 My very first box contained a product that was different than the product described in the Beauty Report. I e-mailed them about it and they sent a full size replacement...no argument! I have been very slow to jump on the subscription styling service bandwagon. It just seemed that there were too many inherent problems, chief among those being price and fit. But I've been keeping an eye on these companies and have been surprised to see that several of them seem to have been thriving over the past couple of years. 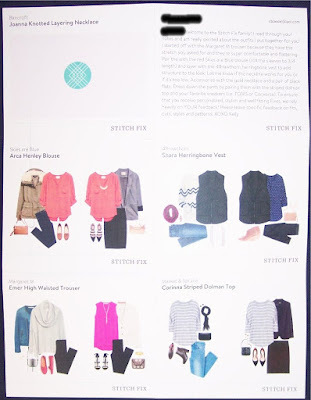 So, when Stitch Fix sent a styling fee waiver, I decided to dip a very tentative toe in the water. With most styling services, the idea is that you fill out a detailed profile about your sizes and preferences and pay a nominal styling fee. 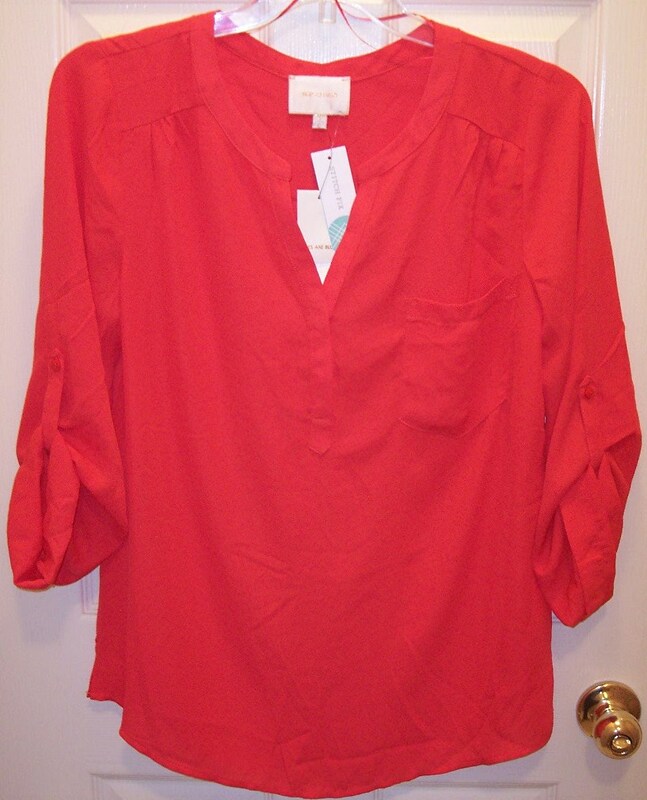 Then they assign a stylist who sends a box filled with clothing and accessories they hope you will like. You pay for each piece that you keep and return the ones you don't want. 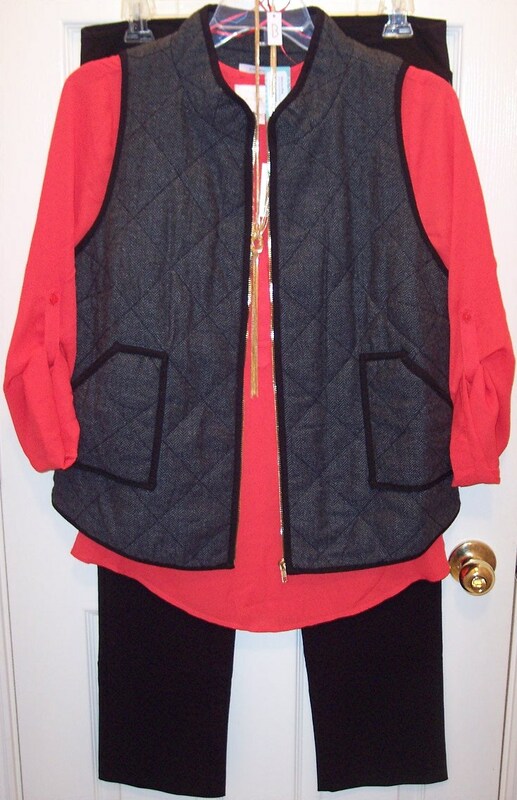 The styling fee is deducted from whatever you end up paying. There is generally a substantial discount incentive if you purchase everything in the box. Stitch Fix starts off with a Style Profile that takes about ten minutes to complete and they charge a $20 styling fee. (Among other things, you are asked which price range you are comfortable with for different items. 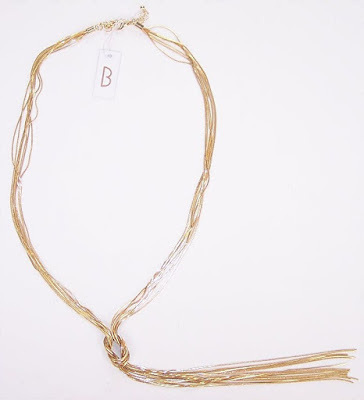 Their average item price is $55 but they have a wide range above and below that.) Then, the stylist hand picks five clothing items and accessories that are unique to your lifestyle, taste and budget. The fee is applied to the price of anything you keep. The profile was quite detailed and gave me confidence in their ability to send things I'd like. My first Stitch Fix box arrived about a week after ordering. 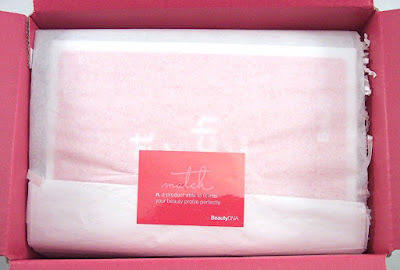 Everything was nicely packaged in tissue paper with a separate little box on the side. (Little boxes = good!) I also saw the pre-stamped pre-addressed USPS Priority Mail return envelope right away which was comforting. 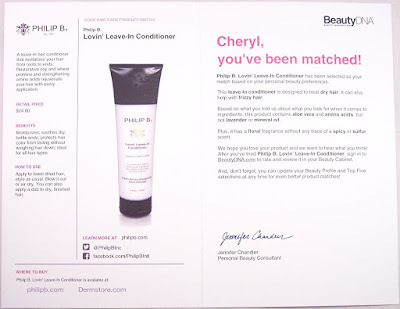 This fold out card contained a personalized welcome note from my stylist (Kelly) and photos showing all of the pieces in the box (plus others) in various outfit combinations. First impression....they nailed my style! 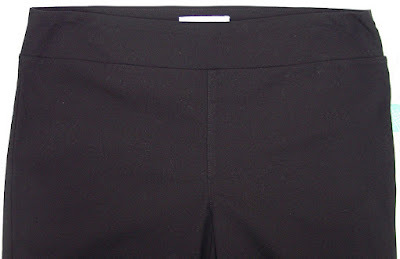 There is a beautiful pair of stretchy black pants from Margaret M; they are marked as "Slimming". These are a big fail for me as they are at least two or three sizes smaller than the size marked. 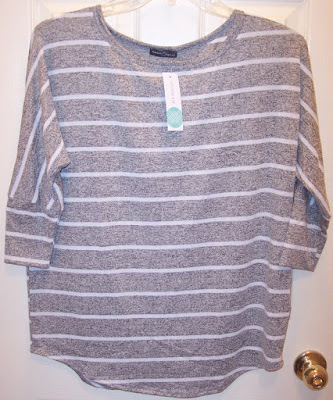 Since I sell a lot of clothes in my real life, I am very familiar with standard size measurements. 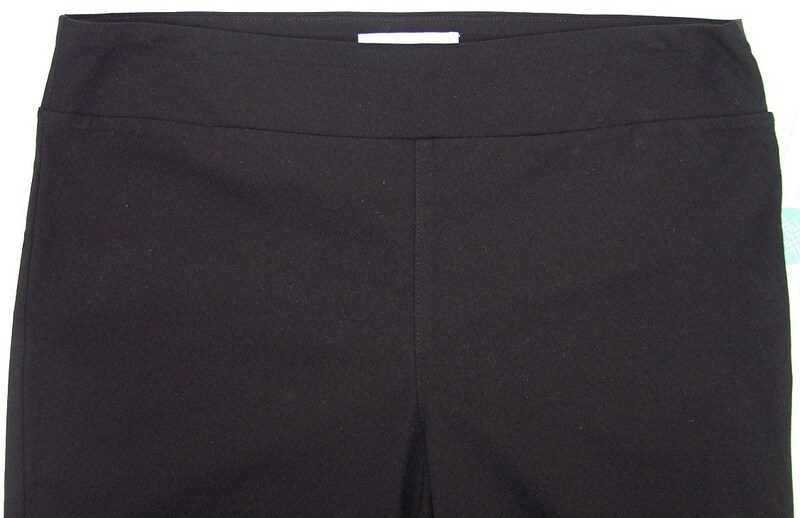 The hip measurement on these pants is a good 10" less than it should be. They are so small that I wonder if they are actually a Juniors size? I love the style (particularly the wide elastic waistband) but the inaccurate sizing completely deletes these from consideration. So does the retail price, which is $98. 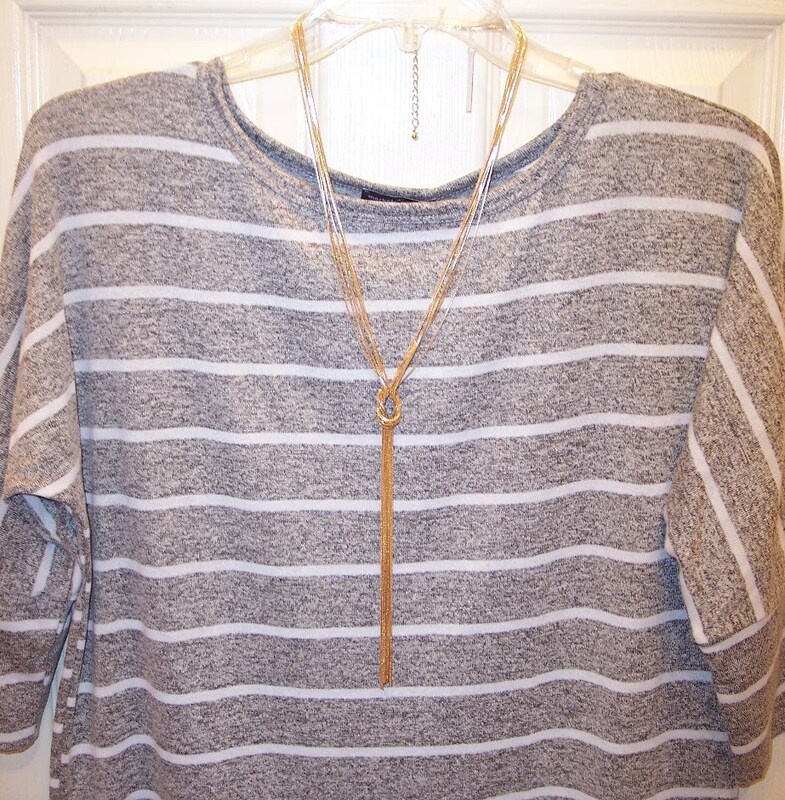 I thought the Stitch Fix stylist did a wonderful job of curation, sending me items that were clearly chosen with my profile in mind. 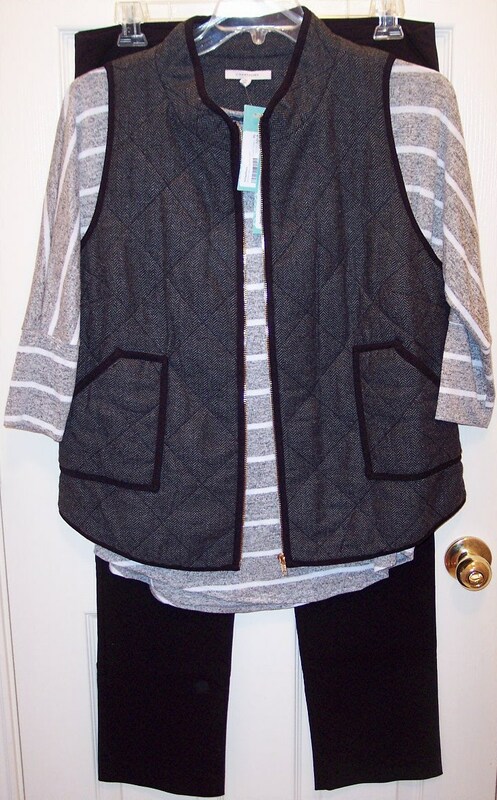 I particularly liked that all the items were "nice casual" and age appropriate, both of which I asked for in my profile. I also really liked that the box contained two complete outfits. The styles and colors are all things I would have chosen for myself. The big fail however, was the pants. Any woman who could wear the three tops in this box couldn't possibly get into those pants! As you can see, this is not an inexpensive way to buy clothes. But there is a huge fun factor and if you can accept that part of the price you're paying is for the services of a personal stylist, this might be a worthwhile subscription to try. 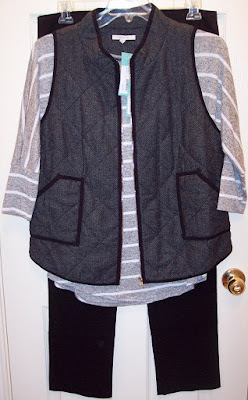 It would be especially useful for working women who need to maintain a certain look but who don't have time (or the desire) to spend a lot of time shopping. Even though I didn't keep everything in this box, I loved the attention from a personal stylist and am eagerly anticipating my next "fix"! Book of the Month Review, January 2016 + 3 Month Discount Code! When I first signed up for Book of the Month, I expected my subscription to be a short one. 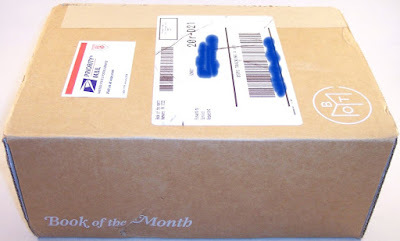 Unlike the old Book of the Month Club which offered hundreds of books every month, only a few books are featured each month under their new business model. A panel of judges reviews and recommends books from thousands that are submitted from dozens of publishers. They choose from a broad range of genres and offer a mix of both fiction and non-fiction. Each judge recommends a book they consider exceptional, sometimes with a short paragraph that explains their rationale for choosing the book. Once the monthly book is in your hands, you can participate in a public discussion forum on their site. To my surprise, I've found that to be quite interesting whether you chime in with your own comments or just read what others have to say. It really does help lend perspective, especially when the narrative is complex. 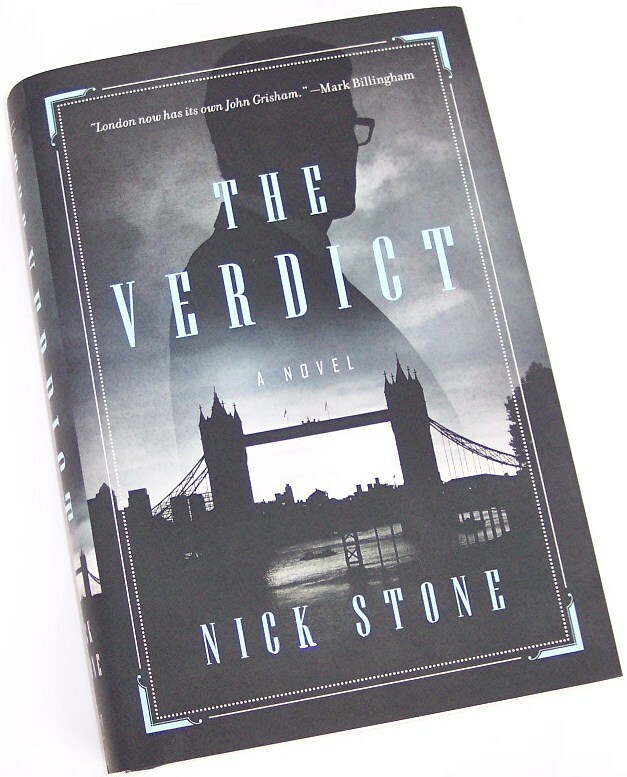 For January, I chose "The Verdict" by Nick Stone which was selected by 36% of members. 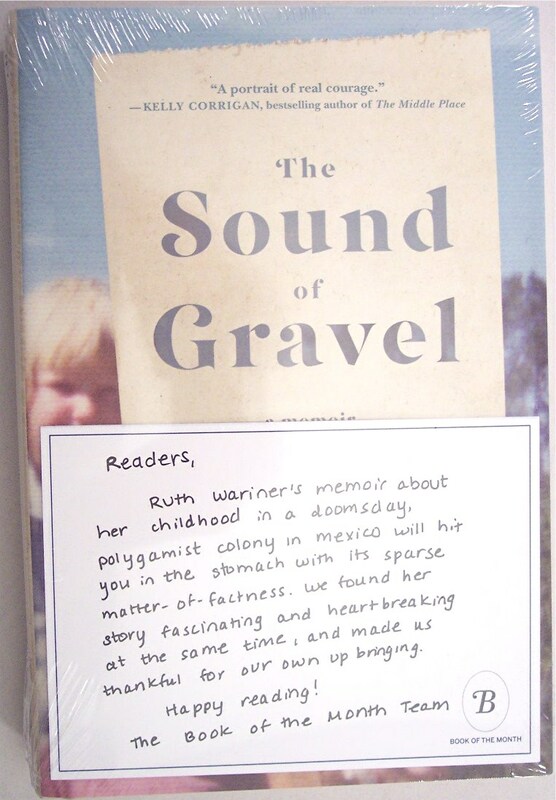 I couldn't bypass the great add-on deal so also chose "The Sound of Gravel" by Ruth Wariner which was chosen by 18% of the members. 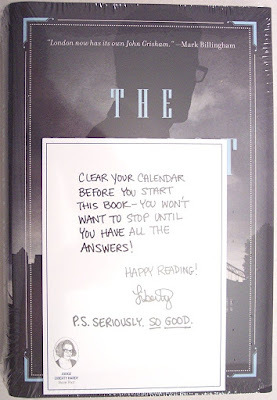 The judge for the first book was Liberty Hardy, an editor at Book Riot. 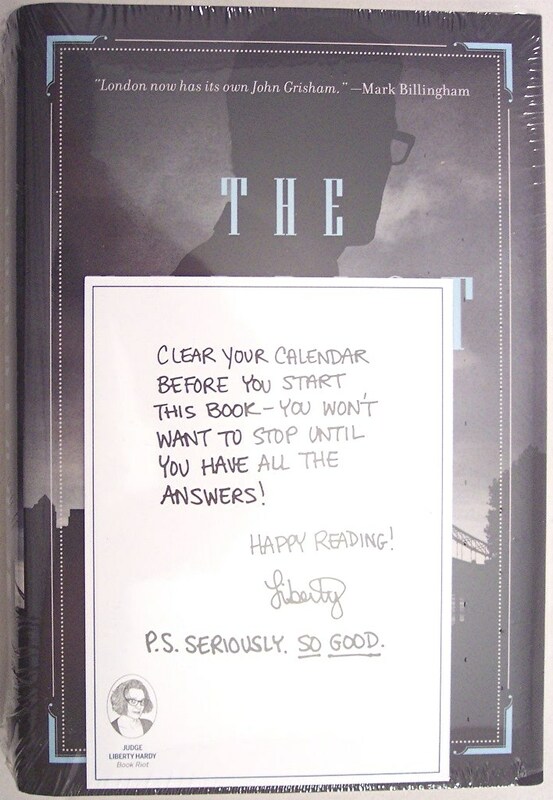 The second book was chosen by Book of the Month. No box is as exciting to me as one that I know contains books...that hasn't changed since I was 8 years old! Since I had just finished a book and was needing something new to read when the BOMC box arrived, I picked up "The Verdict". It's a legal thriller by Nick Stone, an author who has been compared to John Grisham. The plot revolves around a law clerk who is brought in to assist with a murder case involving someone from his past whom he loathes. He is put in the position of having to defend this person who betrayed him and in the process, secrets from their shared pasts are revealed and moral dilemmas must be resolved. This is a big complex 500 page novel. I'm only 50 pages in and I'm already hooked. The narrative style is tight and fast paced with enough twists and turns to keep me up late reading every night. As a courtroom drama set in London, there is the added element of interest for U.S. readers in seeing how the British legal system works. 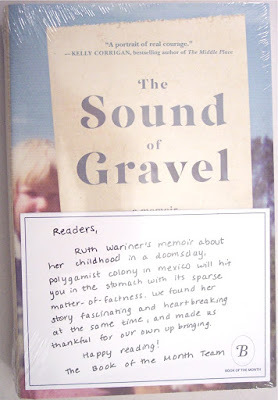 I haven't removed "The Sound of Gravel" from its packaging yet but it's a memoir about a girl who grew up in a polygamist colony in Mexico and the neglect suffered by the children due to a lack of resources to support their huge family. By the way, the lowest available price on Amazon for this book was about $18.18, which is why I thought it was a bargain at BOMC's add-on price of $9.99. If you would like to try Book of the Month, click here and use code BOOK15 to save $12.00 on a three month membership, making it just $8.99 per month. If you're a voracious reader like I am, this is an unbeatable price on some of the very latest fiction and non-fiction! 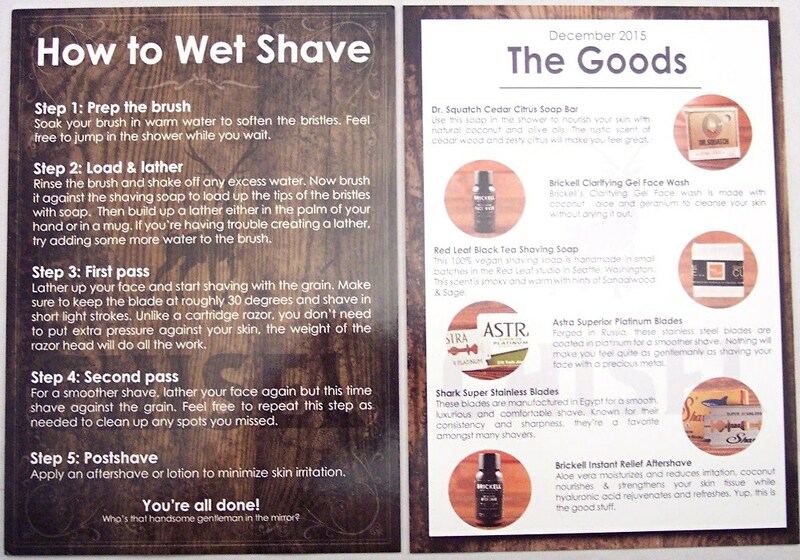 Chisel Shave Club (Wet Shave) Review, December 2015 + 10% Discount Code! 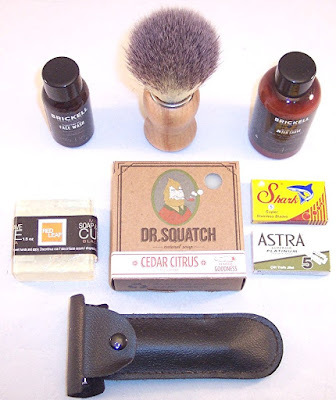 Wet shaving for men has been enjoying sort of a revival lately. The process does require more time and attention to technique but the result is a superior shave with the side benefits of healing and nourishing skin. Partly due to reliance on a single blade, a wet shave reduces the potential for razor burn, skin irritation and ingrown hairs. Inside was a dark blue (or black?) branded box with plenty of excelsior packing! There are two cards in the box. One has a welcome message on one side and "how to" steps on the other side. The other lists the products and gives a bit of information about each. 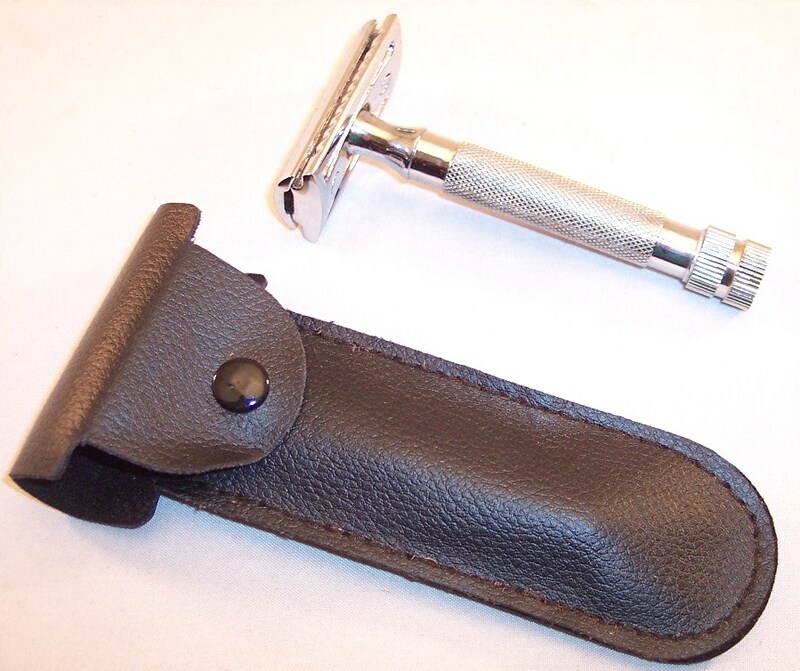 First out is a stainless steel with chrome finish razor handle with Chisel Shave Club's logo on the head and base. This twists open at the bottom and has a textured handle for a secure grip. It is nicely balanced and comes with its own case. 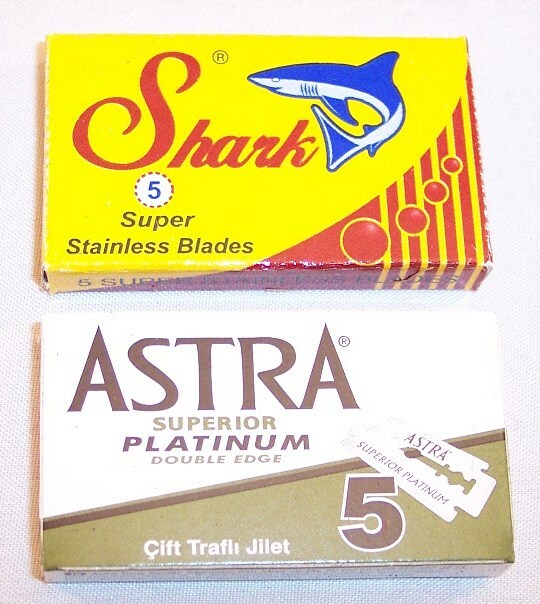 To go with the razor handle are two packs of razor blades, one from Astra and one from Shark. Both contain 5 blades. This Red Leaf Black Tea Soap & Shave Cube is 100% vegan and handmade in small batches. This bar is translucent and has a warm smoky scent with hints of sandalwood and sage. From Brickell is a Clarifying Gel Face Wash which is made from coconut, aloe and geranium; it cleanses your skin without drying it out. I love the not-too-strong masculine scent of this! This is a full size 5 oz. bar of Cedar Citrus soap by Dr. Squatch. 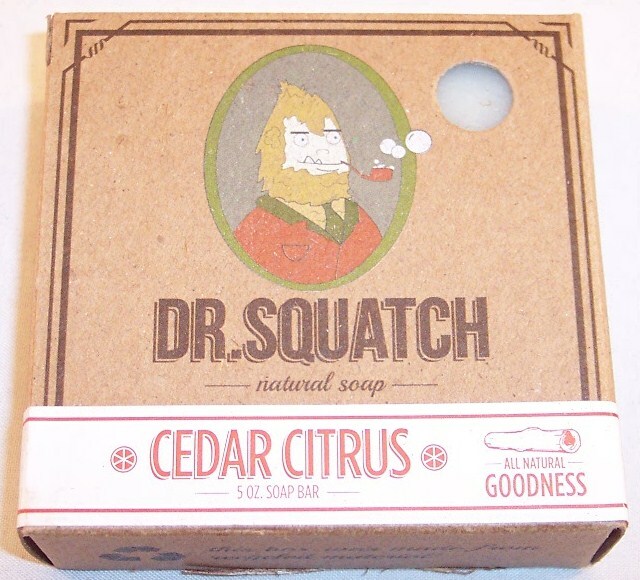 It has a wonderful rustic cedar wood and citrus scent. 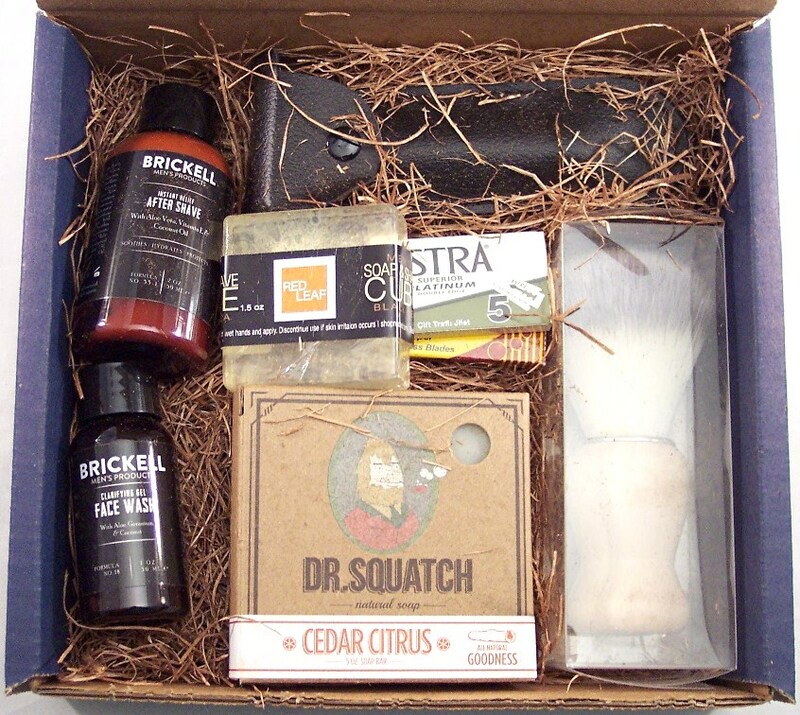 Among other things, the notes on the back say "....as men, we still desire to be wild, free and natural like a Sasquatch". Fill in your own reaction...ha! The last item is a generously sized sample of Brickell's Instant Relief After Shave which contains aloe vera to moisturize and reduce irritation. This is light and fast absorbing and has the added benefits of calming and hydrating the skin. 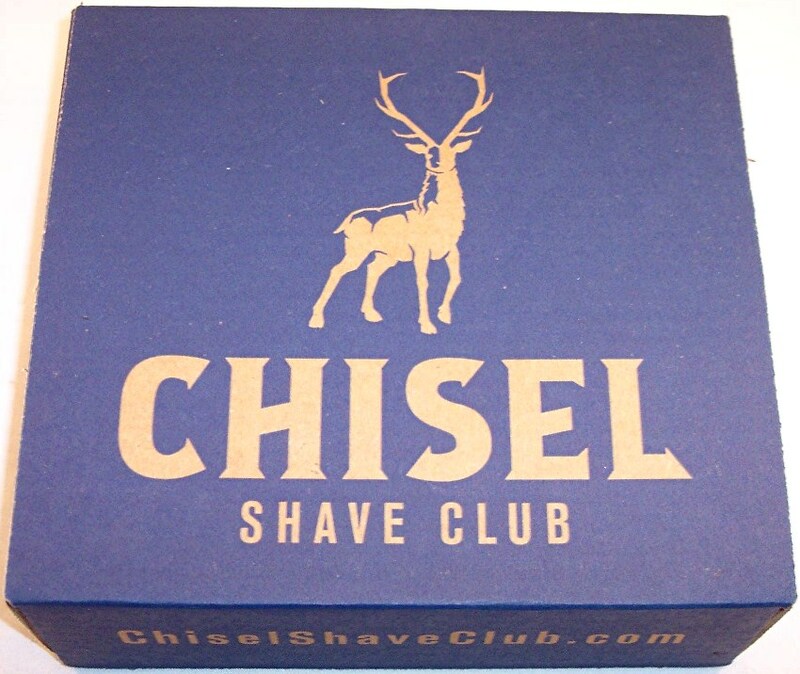 I thought the Chisel Shave Club did a great job of curation and provided a quality selection of wet shave products. 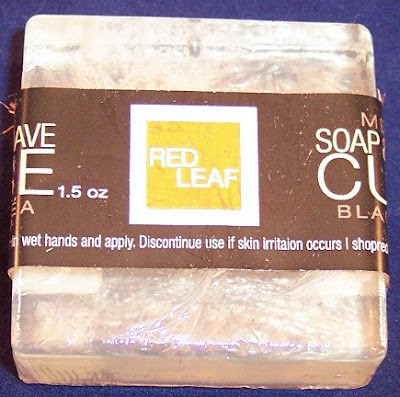 The scents were particularly well chosen and I liked the inclusion of the full size soap. 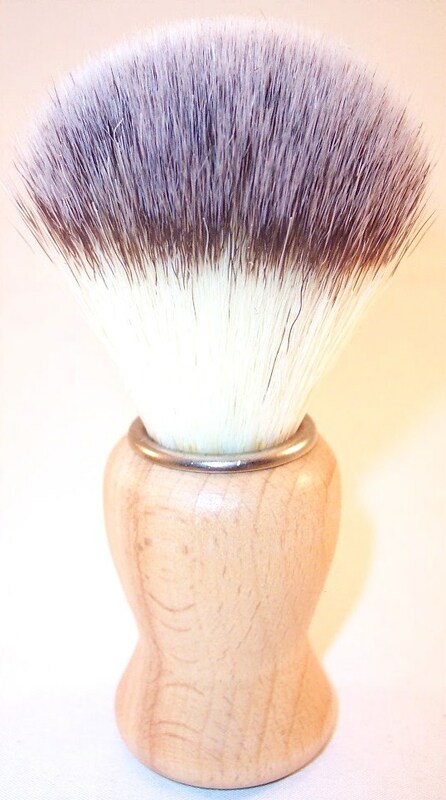 The razor handle and shaving brush are available as extras if you purchase the one or three month subscription; they seem to be very well made and are a necessity for wet shaving if you don't already own them. 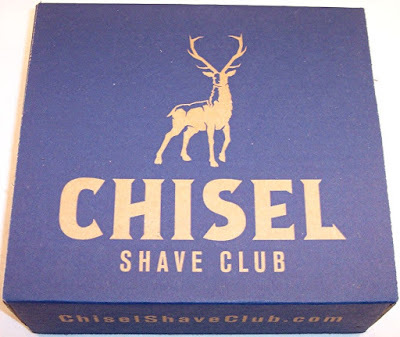 If you're interested in trying Chisel Shave Club, they have generously provided a custom discount code for my readers. Use code LONESTARSHOPPER10 for 10% off your first order. 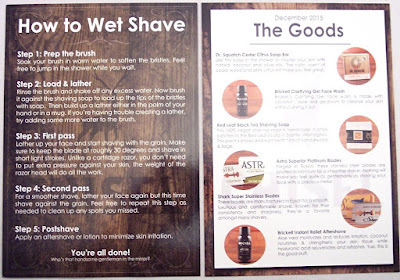 Wet shaving is a retro cool ritual and it's nice to see this manly art being revived!